At 4:40 in this video of a Nicky Romero studio session, he talks about his Access Virus TI Desktop Synthesizer, which he has mounted in a rack: "...I have the Access Virus here, and many of you asked me how I made the 'Camorra' sound or the 'Rockin' High' sound, and also the main part of 'Still The Same Man' which is out now on Toolroom. That synth is also coming from this little thing here. The cool thing is you can connect it as USB, so it's easy to use and you don't need all the stuff like to re-wire... everything runs really smooth." At 1:24 in this video, the Virus T1 is listed as one of the items in Hardwell's music-making inventory. A Virus TI is spotted in Above & Beyond's studio in this video. Chris Lake says in an interview with Future Music, "Possibly the least used synth I have. I just don’t end up using it that much even though it’s very versatile. I think I just need to dedicate more time to it." At the 1:38 mark in the YouTube video "Creating the main part of my new track: 'From Within'", the Access Virus TI Desktop Synthesizer makes an appearance in Headhunterz' studio. He says : "The whole sound only comes from one single patch I created on the Virus TI." Dash Berlin shared a photo showing him tweaking a knob on his Access Virus TI synth. One of W&W's top 3 favorite synths in the studio. They mention "...the Virus sounds very big , has a lot of body and great filtering/releasing..."
One of the hardware synths Deorro uses, spotted amongst a photo of some of his gear. Ummet Ozcan posts a pic to Instagram showing a new studio setup. The Access Virus TI Module can be seen in the foreground. He says, "Studio Upgrade 2.0! New Lights, New Pc, New Sound Interface.. Feels like a kid in a candy store :-)"
"That's been out of use for a while; it's just sitting somewhere in storage now. When they did their update, there was a lot of cool new stuff. Sylenth, I believe, is modelled on a Virus, and we use that a lot. I don't know what it was about the Virus. The interface wasn't quite as good as some others." In this picture from D-Block & S-te-Fan's Twitter, the TI can be spotted above the JP8080. The interface would suggest it's the first TI Desktop model. @8:27 "I've had a Virus B and a Virus Ti"
"Yes they are, and predator and our VIRUS TI!" 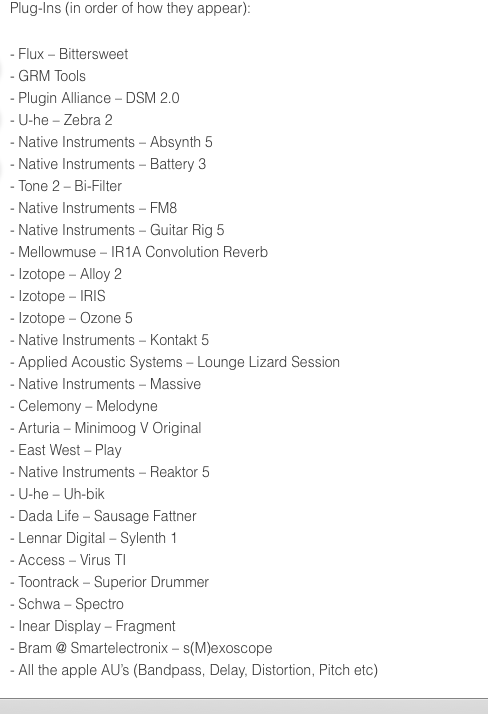 The Access Virus synth's website lists MOGUAI as a prominent user. In DotEXE's tweet, he jokes with FuntCase that his "birthday cake" is the TI (instead of the TI2 in FuntCase's tweet, to which this one was a response). The photo shows DotEXE's Virus TI above his computer keyboard. 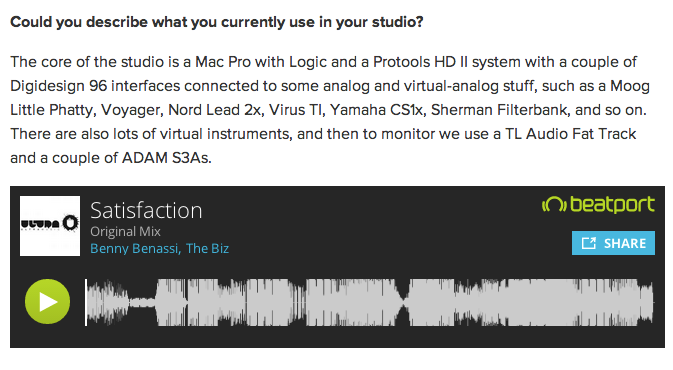 In an [article from *beatportal*](http://news.beatport.com/benny-benassis-righthand-man-cousin-alle-benassi-on-the-ghost-writing-phenomenon/), Alle is asked what's currently used in his studio, he responds, "The core of the studio is a [Mac Pro](http://equipboard.com/items/apple-mac-pro) with [Logic](http://equipboard.com/items/apple-logic-pro-x) and a [Protools HD II](http://equipboard.com/items/avid-pro-tools-hd-2) system with a couple of [Digidesign 96](http://equipboard.com/items/digidesign-96-i-o-analog-digital-converter) interfaces connected to some analog and virtual-analog stuff, such as a [Moog Little Phatty](http://equipboard.com/items/moog-little-phatty-stage-ii-keyboard-synthesizer), [Voyager](http://equipboard.com/items/moog-minimoog-voyager), [Nord Lead 2x](http://equipboard.com/items/nord-lead-2x-rack), Virus TI, [Yamaha CS1x](http://equipboard.com/items/yamaha-cs1x-control-synthesizer), [Sherman Filterbank](http://equipboard.com/items/sherman-filterbank), and so on. There are also lots of virtual instruments, and then to monitor we use a [TL Audio Fat Track](http://equipboard.com/items/tl-audio-fat-track) and a couple of [ADAM S3As](http://equipboard.com/items/adam-s3a-active-monitors)." On this video she shows her setup of synthesizers. The item can be seen 1:13 into this video on the top of the rack on the left. 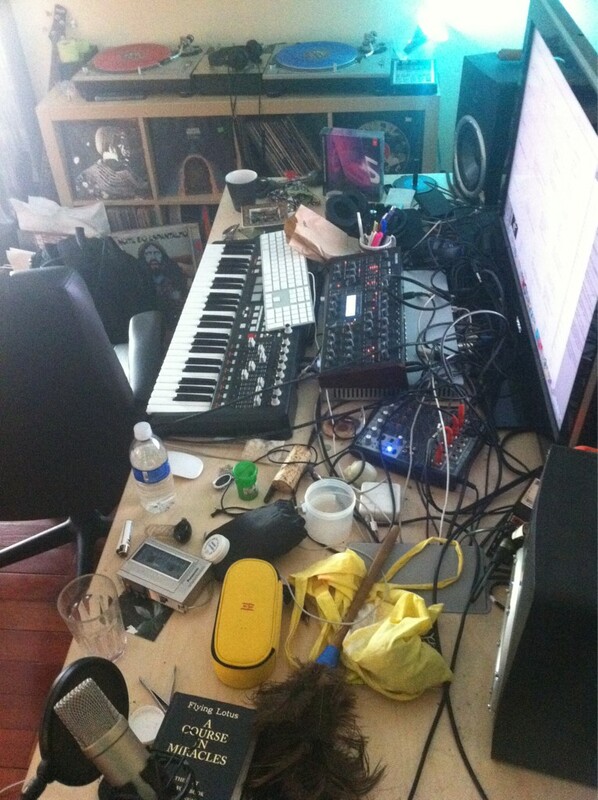 In this photo of FuntCase's studio, an Access Virus TI can be seen on his desktop keyboard. "What led you to include the Virus TI in your keyboard setups? Jeff (Tweedy) had a Virus KB when I first joined the band & I was using that for years until we upgraded our American backline and began keeping backline in Europe, so I was sort of grandfathered into a Virus. When doing the research to update my rig, I couldn't find another "virtual analog" synth that sounded as good as the Virus." in this photo we can see his access virus ti rack! In the minute 03:27 Audiofreq is showing his Acces Virus TI. 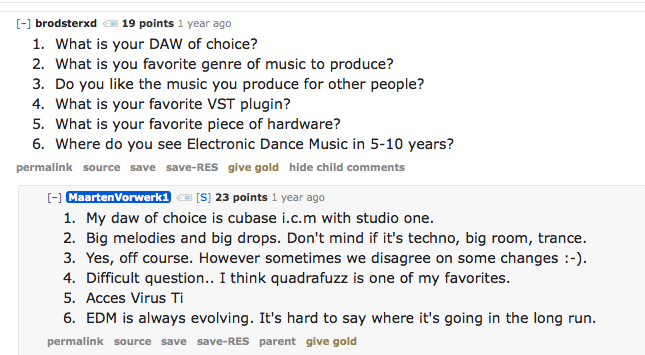 When asked about his favourite piece of hardware, in [this](http://www.reddit.com/r/electronicmusic/comments/20fksv/im_maarten_vorwerk_producer_of_electronic_music/) Reddit AMA, Vorwerk answers "Acces Virus Ti." Hot Mouth shows off his portable studio setup, which includes his MacBook, headphones, and the Access Virus TI Desktop Synth. He posts, "My studio for the evening. Meeting room action"
The Virus TI was the first and most important piece of equipment I bought and I still use it in every track. It’s great for bass-lines, pads, leads – so many options and all sounding amazing! I stuck mainly with Ableton, an Eventide H3 or DSP, Jupiter 6 and Virus TI. Listed under hardware; "Access Virus TI, Rack version" Technically there's no rack version of the Access Virus TI, this just refers to an Access Virus TI Desktop with basic rack ear installation. One can see on his Instagram profile that SWD uses an Access Virus TI desktop synthesizer. in this photo we can see his virus ti..
Mr. Bill uses Access Virus TI, according to [this interview](http://blog.liveschool.net/mr-bill-qa/). An UAD Quad and a Virus-Ti synth that I don't use that much. In his instagram picture, you can see him working in the stuio with the Access Virus Ti Desktop Synthesizer next to him. "Most flexible Virtual Analog Synth I've ever had, can't praise it enough!" In this video at 8:40 Billain mentios how he uses the Access Virus TI to synthesize sounds. Astrix recording new tunes ! "Studio time"
Access Virus synth in the foreground while Neelix takes a food break. In this Instagram pic we can see Access Virus TI on the right. In this picture the Virus can be spotted on the left. It is an important part of the setup. Huge sounds, pads, and leads is what this monster is putting out! I kinda hate the latency problems with it and running it live is a bit of a headache but the sounds are worth it! I recently came back to Virus Ti and not using the usb but direct output to record the sound, Much more fatness is coming out of this bad boy, For beginners I recommend snow version to get you started. Fat. Used on all my tracks. My favorite Synthesizer in rack format. How can I express in words my feelings about the access virus? The immense euphoria of all the laboratory like experiments with sound and using pre-made patch libraries. Reverse engineering many of my favorite artists settings. Creating my own music using only one synth, a laptop for sequencing and sampling and a I/O? To start off, its a Virtual Analog synth that works more like a softsynth in a hardware package. Its the best I've ever used or encountered so far. I'll go into the bad side of things first. It sounds great, and its reputation alone far exceeds its overall capability. I use it for phase, FM and subrtractive Synthesis as well as some mild signal processing with it. Those who become frustrated with it when using it in conjunction need to remember its USB 1.1, which means YOU NEED A MTT/multi transaction translator. Which looks like a USB hub but is much more capable. The only other disadvantage for the virus is its price point. Even used units scare away new musicians with a whopping 1k for a TI series which enables you to use a USB only connection or if you want to milk those ADACS and run TRS lines from your device into a I/o, you can disable USB audio feeds (which also saves the DSP's CPU a little) and set it up for midi only operation, its not that complicated, just remember to set your "main out" to "OUT1 L+R" and do this for ALL 16 channels and the patch utility/config to "surround output" "OUT1 L+R" and make sure its this way on ALL 16 channels and your Virus VST is nothing more than a midi controller with a patch librarian that ultra convenient to use. Remember to record and enable from your DAW's inputs and make sure they're not muted on your recording device, or you'll be wondering why you cant record. Now for the good. A gigantic voice capability, split between 1-16 channels (Keep it low and record what you need. initialized and unused channels wont bog your DSP CPU.) Its one of the best synths I own because it replaces an entire studio of gear and kicks all the old gear I wanted to put into my studio off my shopping list, it emulates old roland gear with ease and can hold its own in many genres. Either rack or Keyboard are rather portable (full sized keyboard I think is 52lbs, not much considering its made of wood and metal and sounds like an entire studios worth in vintage gear.) If you're the kind of person who doesnt want the experimental capabilities of the virus and rather the ablity to use it for perusing giant patch libraries, feel free to purchase or download free many patches created by professionals and generous users alike. While many of us would like to see Kemper gmbh release another Virus, they still support all their devices fully and without additional charge. Even the original "A" virus still have updates available for it, just be sure to put it on a UPC before you dare update it as if the power goes out, you're precious virus is bricked. I love using it for anything and everything, drums, basses leads, analog sound-alikes, Its the epic synthesizer for me. Also, what synthesizer on the market has the ability to set up a "Party" setting? That's right, The Virus TI does. Awesome synth - has a real "sound" to it. So many variations - I'm only just scratching the surface! I've had my virus for about a year now and I use it in pretty much everything I do - it's my go-to synth. The sound quality is second to none and the TI (total integration) means that I get all the benefits of using a softsynth with all the benefits of using a hardware one!